Located in a beautiful area sloping down to the sea, Solaris Resort feels like a large park, full of Mediterranean flowers and plants with lots of trees. This is one of the best known naturist resorts in Europe and has a loyal following of guests from many countries including the UK. This is a lovely resort with excellent facilities and despite there also being a camping section in addition to rooms and apartments, there is a feeling of space. 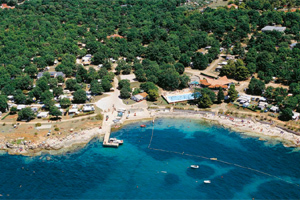 Surrounded by an oak forest, Solaris is an excellent choice for a naturist holiday. There are two choices: Pavilion rooms, which are essentially like hotel rooms with bed and breakfast and half board options. Self-catering apartments are also available for those who prefer to prepare their own meals. Pavilion rooms are in small buildings on two floors connected by external steps and rooms are on ground and first floors. All rooms are identical, decorated in light colours and all have balcony with railings and table/chairs. Whilst rooms are seaside, there are no seaviews due to foliage and trees but you can certainly smell the sea! A choice of twin or double air-conditioned rooms with satellite TV, outside line telephone and connection to reception and hairdryer on request. Bathrooms all have a walk-in shower. 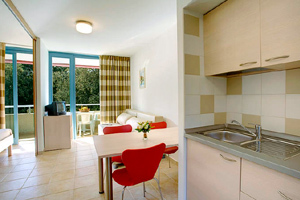 Self-catering apartments are in similar buildings and all apartments have twin beds (there are no double beds). Air-conditioned and decorated in light colours, apartments sleep either three or four people and have satellite TV. Balconies are as with pavilion rooms and apartments for four have slightly larger balconies and all have a washing line. Apartments for four have a bedroom with twin beds and bathroom with walk-in shower (no baths). The lounge area has a small kitchenette featuring a fridge, 4-ring hob, extractor and crockery/utensils plus a dining table for four and a sitting area. There are no kettles so consider bringing a travel kettle if this is important to you. There are two additional single sofa beds in the lounge area. Apartments for three are equipped as for four with a sliding door separating the bedroom from the living area. There is a sofa bed for one in the living area. All the bathrooms have walk-in shower. At reception there is an information point and internet facilities (charge applies). Guests staying in Pavilion rooms take breakfast in the main Solaris restaurant where dinner in the evenings is also served for guests on half board. 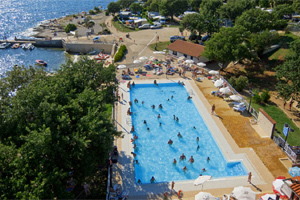 There are two other restaurants, Galeb and Sidro and both are a la carte serving everything from pizza to full meals and guests must wear clothes in the restaurants except for the Sidro which has an outdoor seating area and is located near the pool, close to the beach and where guests can be naturist. The Blue Flag beach is 2km long, has showers, and has rocky and pebble sections. There is one freshwater pool for everyone. The pool area has free sunbeds and umbrellas. Maro Club is a free kids club (three years to early teens) and there is a small unsupervised playground. There are two supermarkets, a bakery and two shops selling beach wear. Beauty centre and hairdresser and massage is also available by the pool. 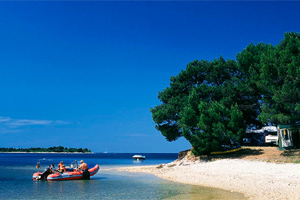 Great selection of sports including beach volleyball, tennis, outdoor table tennis and mini-golf (all at extra charge). At the Sidro restaurant there is live music two or three evenings a week on the outdoor terrace. Usually twice a week there is music and a Latino/Romantic party on the beach. On the first Saturday in August there is a carnival with masked groups, a competition and a big party at night.